The Eppendorf 5430 Microcentrifuge brings you the compact footprint of a mini centrifuge, with the flexibility and power of a larger model. This benchtop centrifuge accelerates quickly with a maximum RCF of 30,130 x g and maximum rpm of 17500. This micro centrifuge also makes use of a robust rotor library, with auto rotor detection making it adaptable to a wide variety of assays. The Eppendorf Microcentrifuge 5430 delivers flexibility by accommodating aerosol-tight quick lock rotors that can hold 1.5/2.0mL tubes, 13/16/26/29mm round-bottom tubes, 15/50mL conical tubes, PCR tube strips, and microplates. This benchtop centrifuge comes with an FA-45-48-11 Fixed Angle Rotor with an aerosol tight lid. This Eppendorf Microcentrifuge 5430 manages user parameters through the upfront soft button key digital display with a memory bank that stores up to 50 user defined programs, and 5 quick buttons for frequently accessed programs. This eppendorf centrifuge also decelerates in 15 seconds, with a soft brake to protect the more delicate samples. The low access height of the centrifuge makes loading and unloading of samples quick and painless. 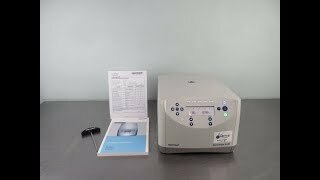 This Eppendorf 5430 Microcentrifuge has been fully inspected and is performing to factory specifications. All of our lab equipment comes backed with our standard warranty. Should you have any questions, please don't hesitate to contact us.